Getting your first piece of work right on the cover is always awesome! Big anatomy – not out of proportion, but the kind that fills up a panel and puts people in dynamic positions. Especially people charging towards the reader at high speed! BANG AGAIN! EVEN MORE IN YOUR FACE! Action and drama – the kind of pacing and pose selection that got him plenty of gigs in the world of American superheroes for many years. Beautiful action choreography, and I do love an artist who draws in background sound effects. There’s also no getting around the fact that, for the early days at least, Hairsine’s work was notable for looking kinda a lot like early McMahon. Don’t get me wrong, it’s powerful stuff, but the comparison is, well, notable. 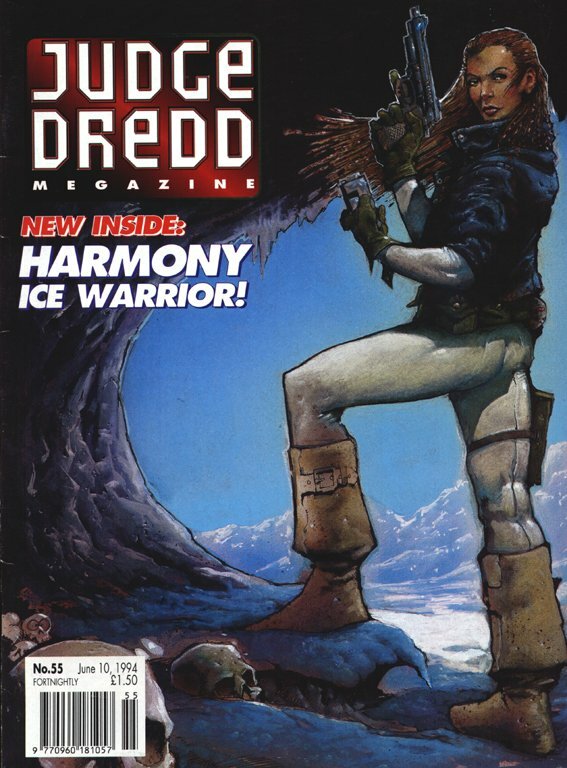 Trevor Hairsine got his break in 2000AD introducing a whole new character, indeed the cover star twice in her opening series: Harmony. I’ll get back to her later. 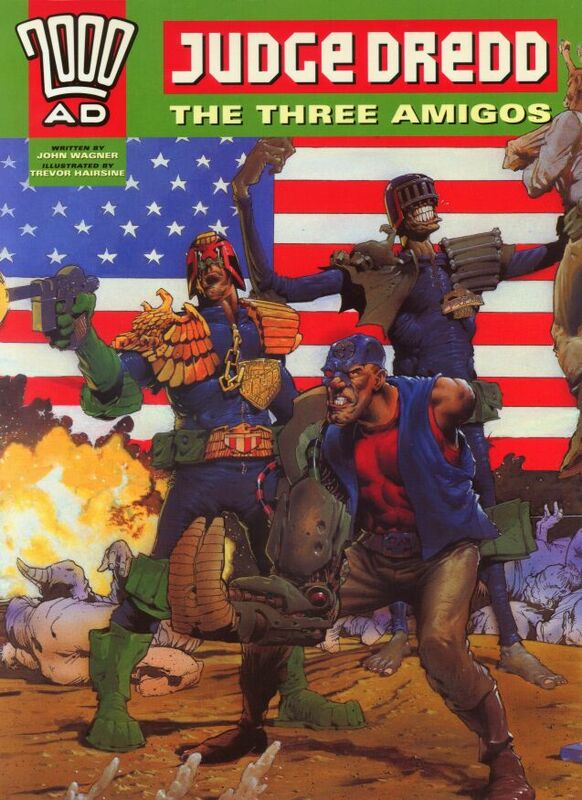 Rather rapidly after that, Hairsine became something of a star Dredd artist, for example drawing the Megazine episodes of Dredd epic Wilderlands, and then immediately delivering new serial Three Amigos, designed to be a classic story that would draw in new readers with the relaunched Megazine volume 3, itself timed to coincide with the enormous popularity of the 1995 film Judge Dredd (except it ran a tiny bit late). 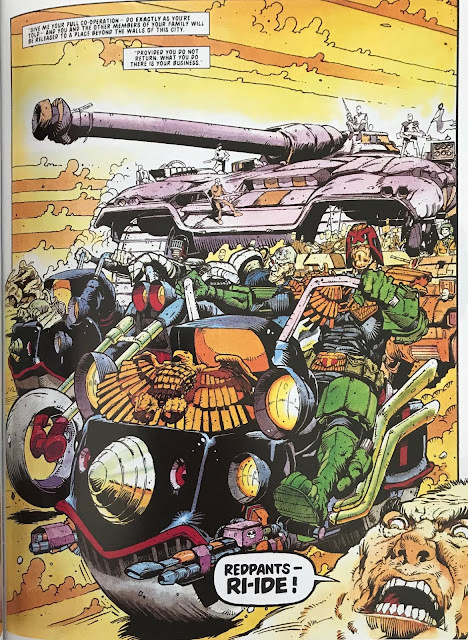 So, the Mick McMahon thing. 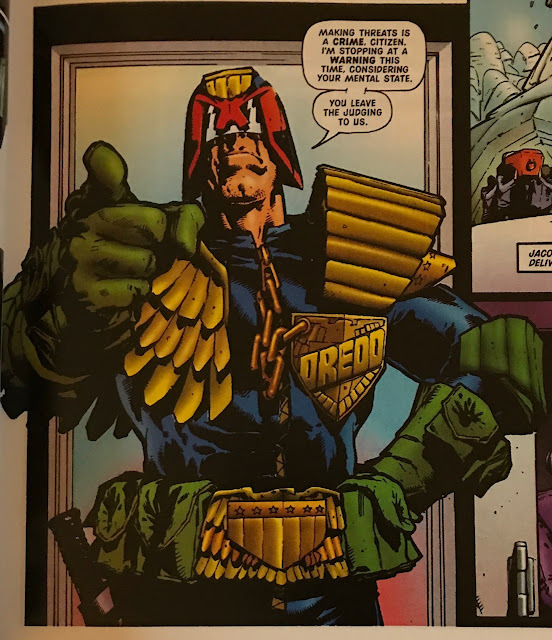 Not only was Hairsine using that look for his Dredd work, his very first gig on the Megazine came through exactly in time with McMahon’s own triumphant return to Judge Dredd for the first time in decades with Howler. It’s a little as if editor David Bishop knew people would be scratching their heads at mid-90s McMahon, perhaps expecting him to draw in the same way he did back in 1981. 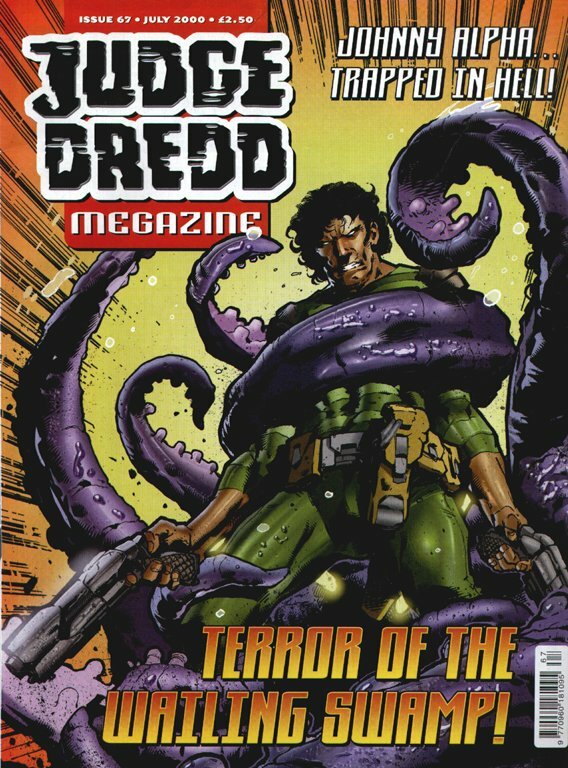 And to temper that reaction, he found a McMahon-ish artist to draw for the magazine. 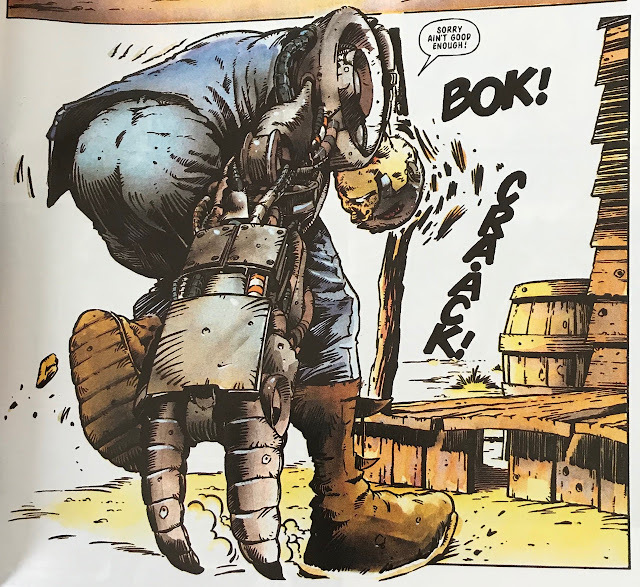 I mean, if you've been asked to recapture the spirit of classic Dredd epic the Cursed Earth, you can't ask for better! As it is, Howler came in for a bit of a kicking on its initial run (as I recall from the letters pages, anyway), but is now seen as something of a classic Dredd tale. Hairsine meanwhile found instant popularity – as he deserved! – although time has been a little less kind to the stories he drew, with Wilderlands and Three Amigos both seen as lesser Dredd. Dig those McMahon-style giant boots! Also the classic 'hunched' pose, the better to fit into a small panel. Atmospheric action with a spooky bent. 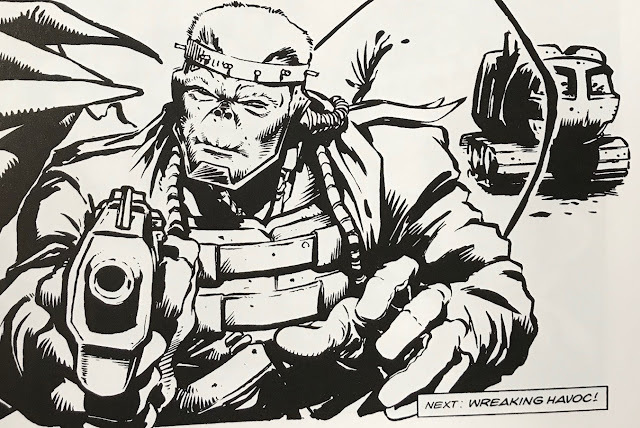 Crucially, Hairsine is not and never was a McMahon clone – it’s more that, for a specific gig, he chose to draw in McMahon’s style, (much like McMahon himself was once explicitly attempting to ape Ezquerra). As you can see pretty clearly by going back to the beginning, he has his own thing going. Check out Harmony: Blood & Snow. This style, to me, is a) it’s own thing, and b) VERY much of the mid-90s. It’s both sketchy and detailed, cartoony and serious, with hard action, visible sound effects and motion lines, and combining that action with both horror and comedy. It’s actually quite a lot more Simon Bisley than Mick McMahon, if you want to make artist comparisons. 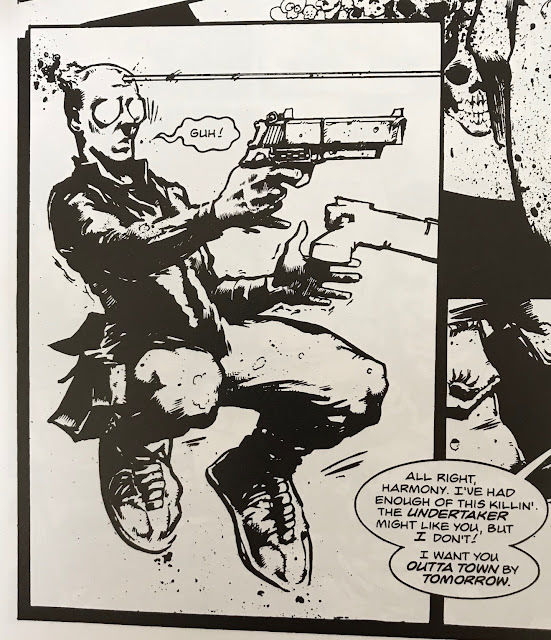 Look, Hairsine has even drawn Mr Bisley into this page! That's him with the sunglasses, yes? 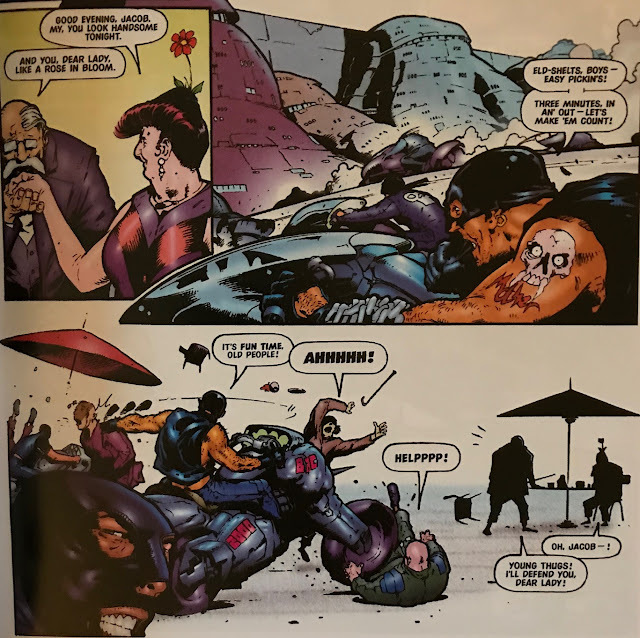 And in general, the goofy bystanders and background comedy is, for me, an example of the sort of Viz-esque / grown-up Beano look of 1990s funny stuff as popularised by the Biz (not to mention Jamie Hewlett). Of course, Hairsine is also just meeting the script head on. 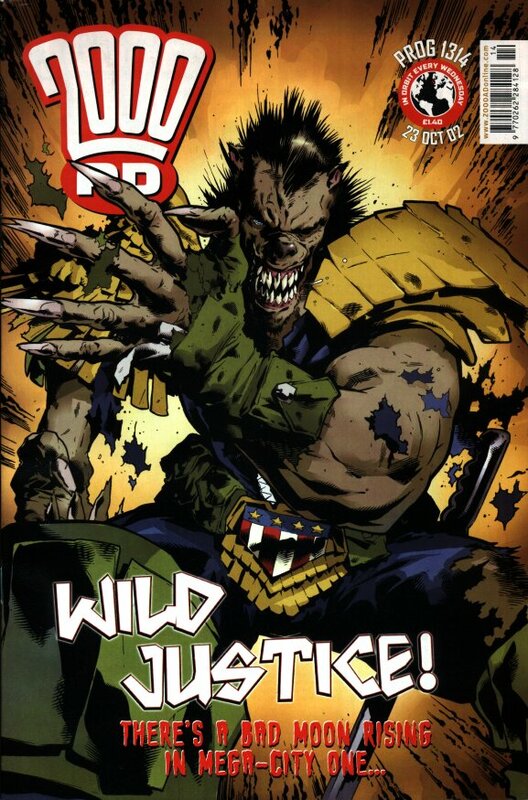 For my money, Harmony as a series got more interesting when she left the wilderness and went back to the city (when the series rotated between other artists), but Hairsine remains the most accomplished comics creator to work on the strip, wild and weird as his opening series was. 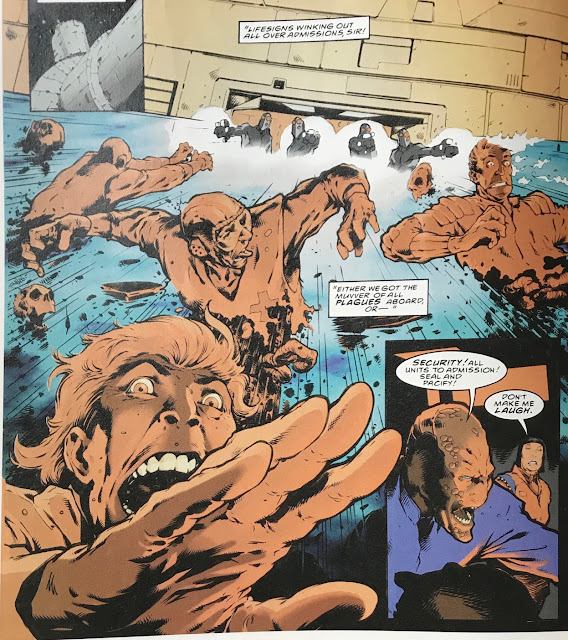 I mean Blood and Snow is sort of a bounty hunter thriller with a revenge plot going on, but then it turns into a ‘The Thing’ riff, only set in a Benny-Hillish nudist colony instead of a spooky research station. 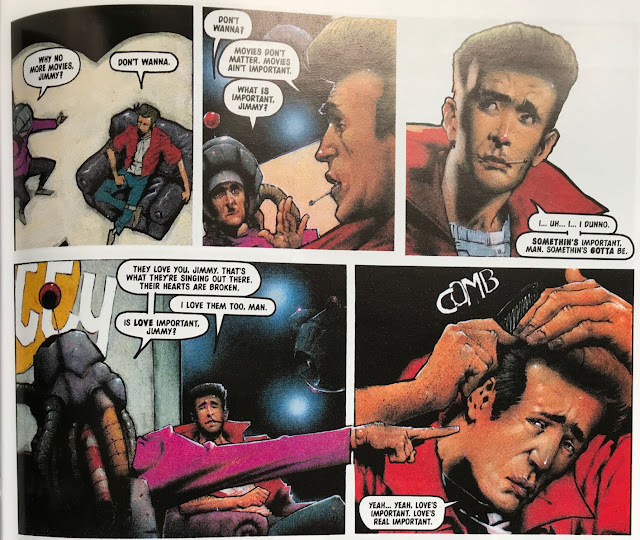 The shifting tones ought to be super weird, but somehow Hairsine (and writer Chris Standley, of course) keep it amazingly consistent, with the humour setting at sardonic meets deadpan meets ‘expectation of OTT action at any moment’. 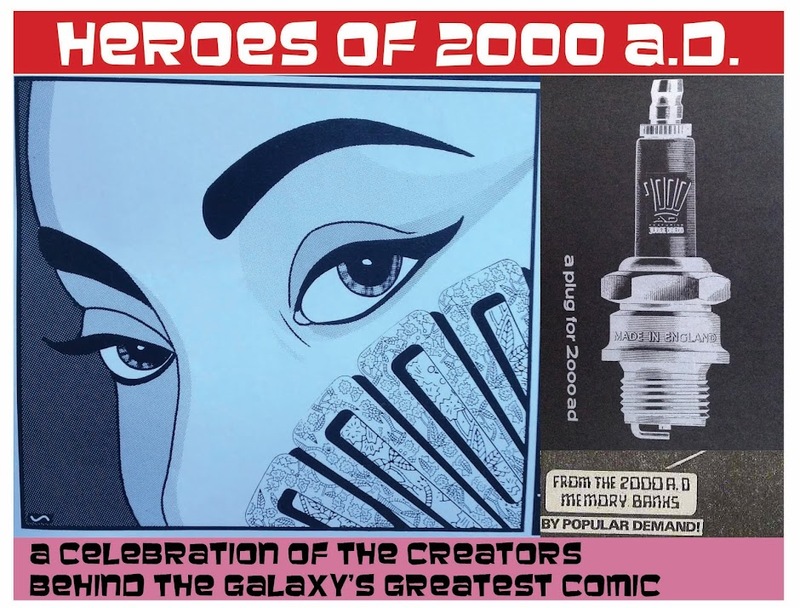 In other words, totally 2000AD. 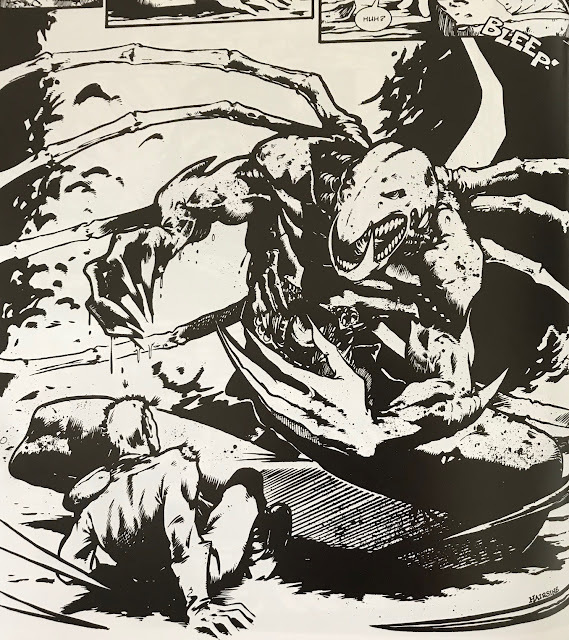 Where the heck did a scary alien monster come from in this tale of Bounty Hunters? It did get a bit bogged down in having too many characters, and to my mind it was a shame that the villain, Havoc, had a more consistent and indeed simplistic design than Harmony herself. 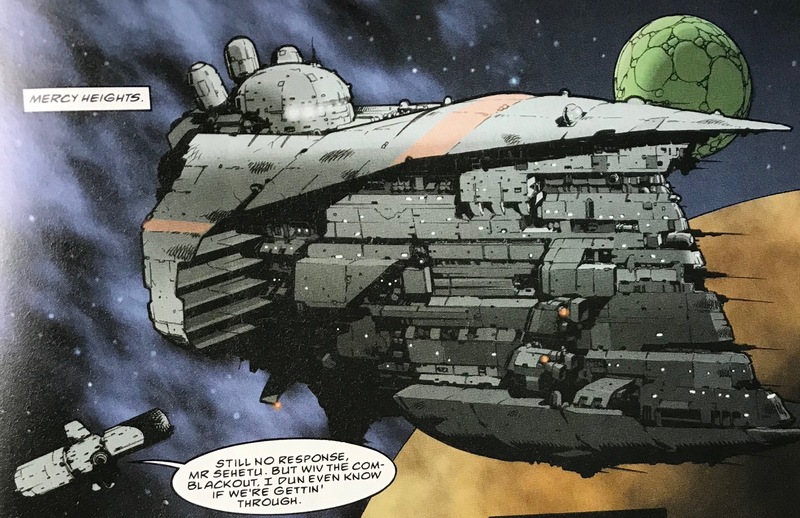 It’s kind of a rule that in the first series with a brand new character, you need to show your hero front and centre as many times as you can, ideally with the same hairstyle/clothing/weaponry, so that readers will get to know her. Sadly the requirements of costume and setting changes in this story made that impossible. 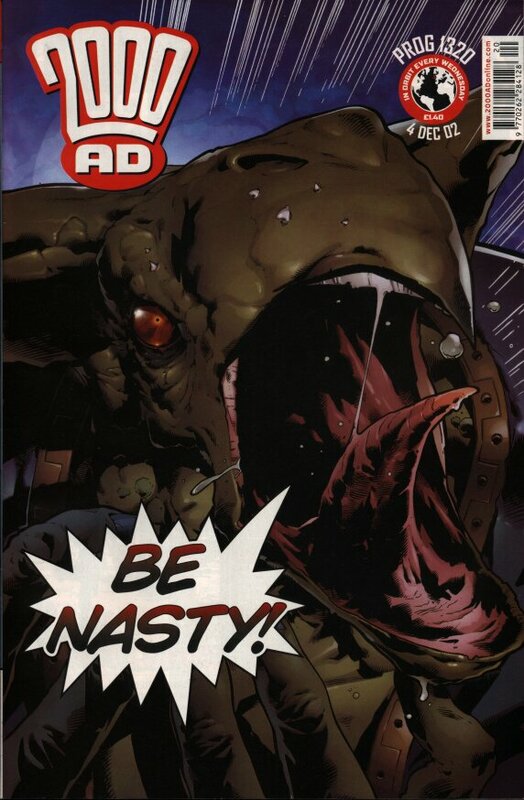 Can't remember if Havoc is a mutant, an alien, or just a dude with a squished nose, but he's a classic 2000AD antagonist. He's a great fit for this kind of setting, adding some humour to a dour situation simply through facial expressions. and then joining a large team on weekly Dredd, with a bit of Anderson, Psi thrown in. 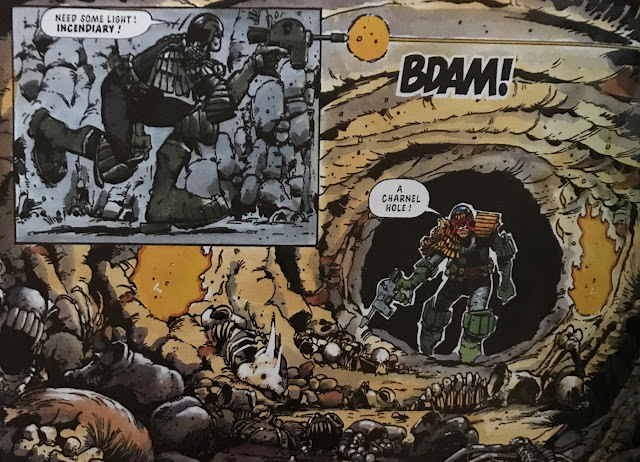 This time he’s doing it his own way, bringing back a lot of the 1990s cartoony but sort of realistic action vibe, and dialling back the McMahon stuff. Still going strong with the full-figure posing. 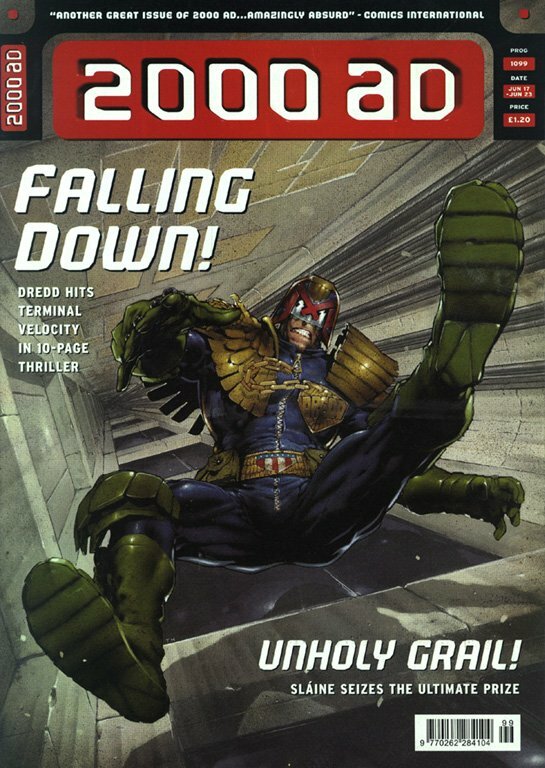 This one captures Dredd's supreme confidence so well! It’s not all Judge Dredd – he had a go at a Sinister-only episode of Downlode Tales, and tackled the first half of book II of Mercy Heights. 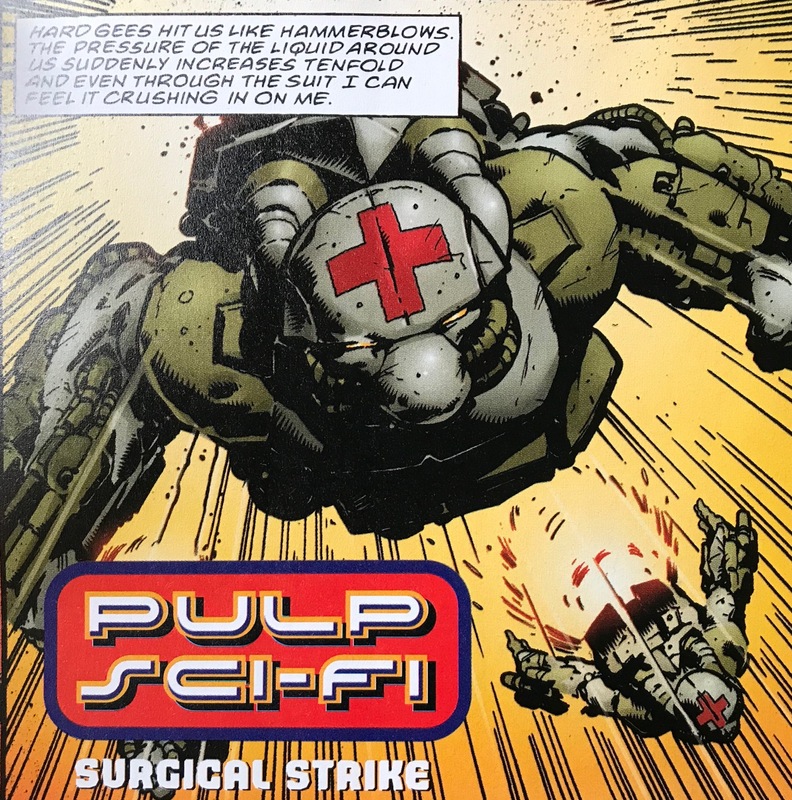 For my money, his episodes are on a par with Kevin Walker's work on the original, and It’s arguable that the space hospital saga would have fared better had Hairsine been able to complete the whole thing – or possibly if writer John Tomlinson had been able to structure his soap opera so that different episodes focussed on different characters, thus not requiring each artist to draw each person, and indeed each setting, entirely consistently. Enough deliberating, let’s bask in some Hairsine storytelling goodness, eh? More epic sound effects, this time drenched in blood! but I don't know it. Looks cool, though, and it kind of functions as an invisible panel border. Neat. Hairsine's more painterish style for this one. If you don;t find this kind of thing funny, I wouldn't recommend Judge Dredd. Is there a hint of Alan Davis in there, or is it just me? The loneliness of Finnigan Sinister. 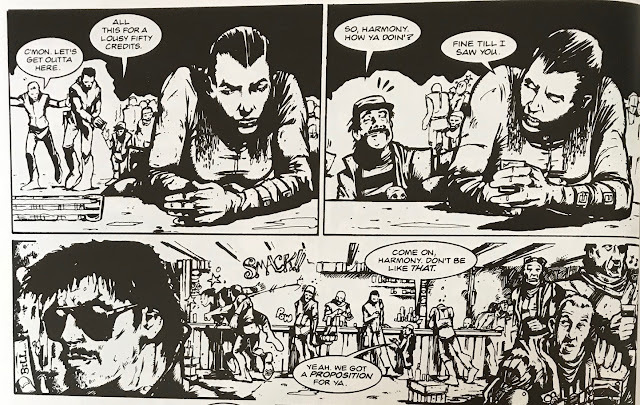 To an extent, Hairsine suffered from never really having a crack at a great 2000AD series. 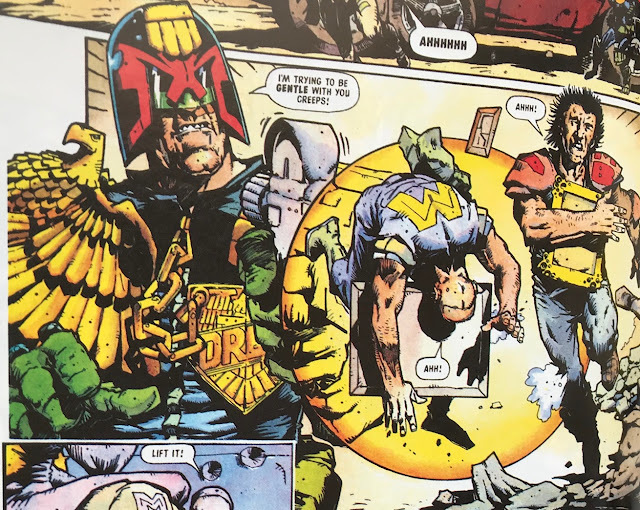 Some of his shorter Dredds are pretty fun – the final Taxidermist outing, the hilarious tale of Chairman Dilbert – but nothing to rival the top tier of 2000AD, which means I sometimes think he’s not that well remembered amongst the pantheon of 2000AD art legends. And none of that’s his fault, ‘cos he’s damn good. 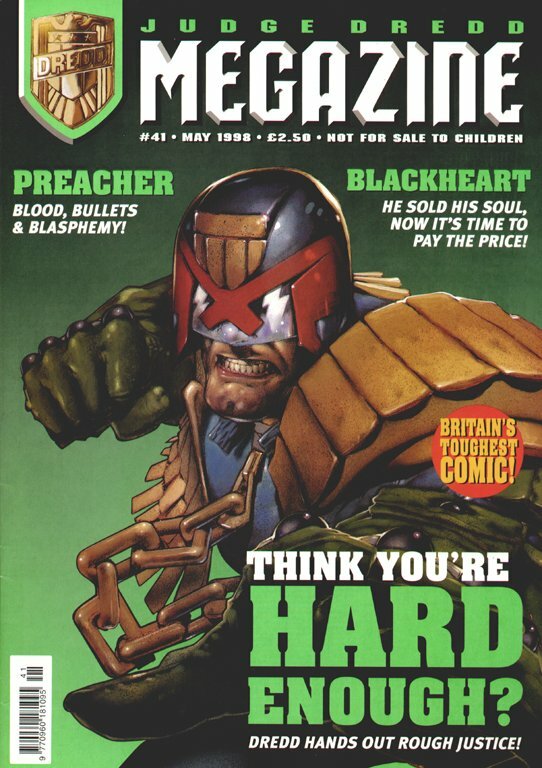 He kept in touch over the years with some cracking covers, before disappearing into the American comics fold. 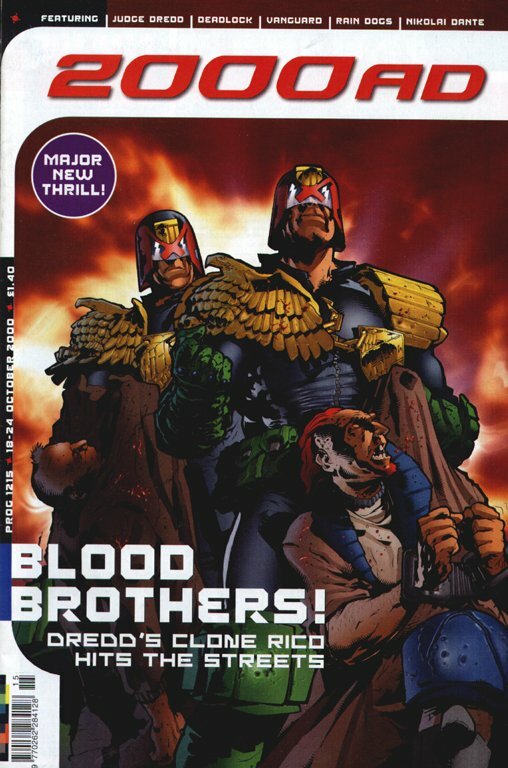 Much, much later, Hairsine has turned in a few more pages on Dredd, scripted by his old Cla$$war buddy, Rob Williams. As you'd expect, his style has evolved quite a bit; it's lost that kinda scratchy, thick-lined look he used to use. You could even say that the McMahon influence has morphed more into a Bolland-look, to pick an artist whose style couldn't be further removed! 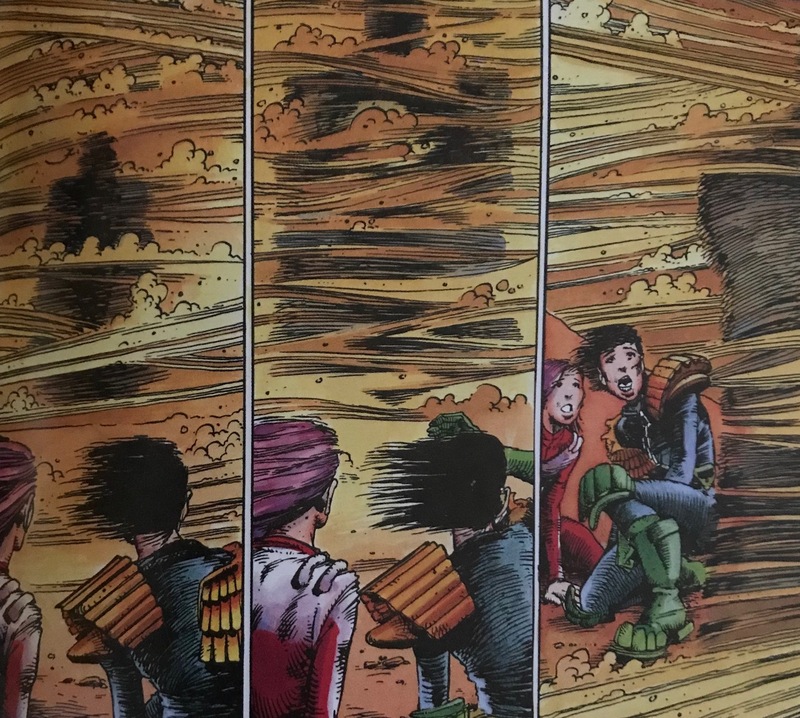 But the dependable action beats are very much still intact, and it'll be a treat if we get some more in the future. Who knows? that still retains some of that Blood & Snow feel. Hairsine still delivers the posing goods, and those 'pushing limbs out of the panel and into your face' perspective tricks. 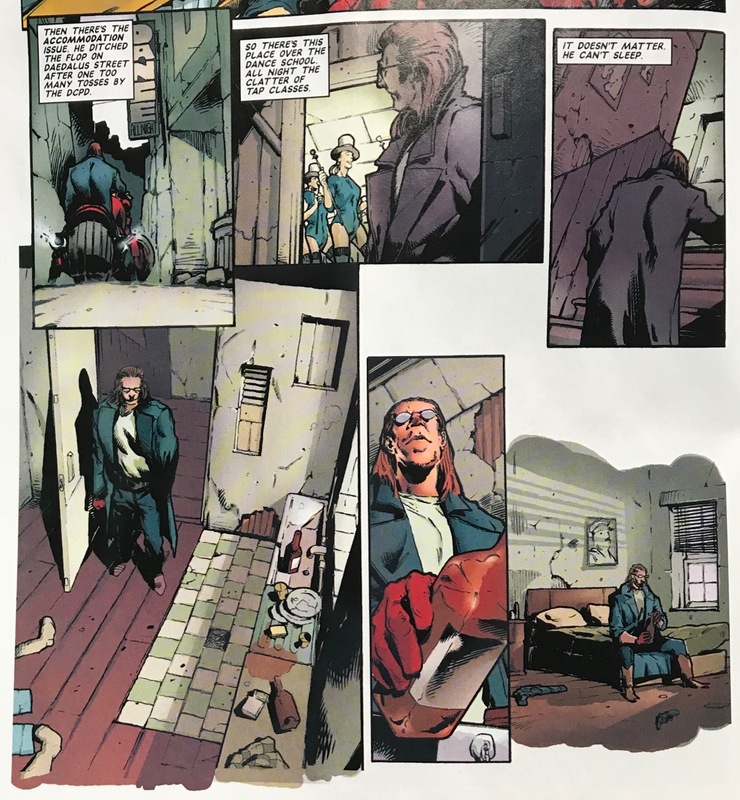 If you're fixing for more Hairsine, I’d recommend his most recent work with Valiant comics, which is kind of a half-way point between superhero comics and 2000AD*. High concept, high-octane action with a thick seam of cynicism, sarcasm and plenty of high-cultural references (and some pop culture, too). That said, I could stand to see more Hairsine in the Prog for sure! There’s surprisingly little on the internet – his own website seems to be out of service, and I can’t find any interviews! and this brace of monsteriffic covers! The Get Sin pages are Hairsine under Barry Kitson inks, I think. Which explains the Bolland. Hairsine's art on Skulls (1836) featured inking much closer to his own aesthetic.